This system is based on the use of two containers in which brushes, roller sleeves and other equipment are first washed and then rinsed. By rotating the containers the solids in the paint are separated from the liquid making it easier to dispose of each component. This system will work well for both waterborne and solventborne (oil or alkyd) paints. For solventborne paints use mineral turpentine and any other paint solvent recommended by your local Resene ColorShop or Reseller. At the end of the job wipe or squeeze excess paint onto an absorbent material, such as old rags, shredded newspapers or cardboard boxes. Allow to dry and dispose of with household waste. Wash brushes, rollers and other equipment with water in a large pail. The most effective method is to use a roller spinner. Transfer the washed equipment to a second container filled with clean water for a final rinse. Place lids on the containers or cover in some other secure manner and allow to stand overnight. By morning the paint solids in the first container will have settled down to the bottom of the container. The clear water from this container may now be poured onto the garden or any grassed or open area away from streams, rivers or lakes, where it can be absorbed into the ground. Now to dispose of the paint solids at the bottom of the first container. Scrape the paint solids out onto absorbent material, such as old rags, shredded newspapers or cardboard boxes. Allow to dry, then place in a plastic bag and dispose of with household rubbish or take directly to the nearest council tip. The second container now can be used as the first wash. Use this rotation system until the job is completed. Use solvents to wash equipment. Allow the first container to stand at least 24 hours as it will take this long for the paint solids to settle. Do not pour the clear solvent onto the ground - use it to top up the second container or decant and keep for future use. Use the least amount of solvent. Never allow waste water or chemical solvents from washed paint equipment to enter household or stormwater drains or sewers. The waste may find its way into natural waterways where it can reduce oxygen levels and threaten the survival of fish and other aquatic organisms. It’s a good idea to keep a container of ‘dirty turps’ on hand for cleaning purposes. Kept in the original container and in a safe place, you will be able to reuse the solvent time and time again. Remember not to shake it up as this will disturb the paint solids, which will have settled to the bottom of the container. If paint is accidentally spilt, clean it up as best as you can with a cloth or newspaper. Then treat with Resene Emulsifiable Solvent Cleaner and rinse with water. By treating the spilt paint with Resene Emulsifiable Solvent Cleaner before washing down you will save solvent and give yourself less work to do. A plastic pail with a tight fitting lid is ideal for the short term storage and transport of brushes and roller sleeves. Fill this pail about halfway with water so that brushes etc are covered. This will save you from having to clean brushes and rollers whenever work is interrupted. Wrapping a paintbrush in cling wrap will prevent the paint drying on the brush while you take a lunch break. Similarly put your roller into a plastic bag and tape it around the handle or submerge the roller in the paint in your roller tray to keep the paint moist during your break. Resene has contained wash systems available for trade contractors. See the Resene WashWise brochure, or your Resene ColorShop for more information. The best way to save waste is to avoid buying too much. Carefully measure the area you plan to paint and use the coverage recommendations on the side of paint containers to check how much you need or ask Resene ColorShop or Reseller staff for assistance. If you buy what you need and find you have paint left at the end of the job, you have probably applied it too thinly – in which case the best idea is to paint an extra coat to give the surface full protection as a thin coat means that the paint finish will not wear as well. Don’t be tempted to buy an unnecessarily large pack size just because it is on special – remember the best deal is the one that gives you just the paint you need. If you have leftover paint, use it for touch-up jobs and smaller projects or add another coat to your paint finish for extra protection. Waterborne paints are also ideal for creating signs and banners and can be a much cheaper and more durable option than expensive felt pens – this can be a great way to use up any extra paint you may have. Brushes or rollers can transfer contamination from the surface you are painting back into the paint. The best way to work with paint is to tip out a small volume into a separate paint pot and use this for painting. Pour out only what you need for the job. This will leave the paint in the main paint container fresh and untouched by your brush or roller. Properly stored paint can last for years. Cover the top of the paint container with plastic wrap, place the lid on securely and store upside down. The paint will create a tight seal around the lid and will remain fresher for when you next wish to use it. Store away from extreme heat or cold. Keep out of reach of children. Once you’ve used up your paint, recycle the empty paint container – simply allow the contents to dry out, then bring to a Resene PaintWise collection centre with the lid off the container so staff can see it is dry and empty. Each paint container you recycle is one less container that ends up in a landfill. If there are no Resene PaintWise collection centres in your area, contact your local council for recycling options. Clean out paint containers and pails and reuse them as paint pots or buckets. Use inside drains (not the stormwater drain) or wash onto your lawn. Donate Donate to charity If you just can’t use your leftover paint, donate it to local community groups, schools and art groups. You’ll save them money and get the best use out of your paint leftovers at the same time. Don’t mix waterborne and solventborne paints. If mixed, paint cannot be re-blended or reused. Make sure you donate the paint in its original container with the contents clearly marked so the recipient knows what they are receiving and how to handle it. Always check paint before you donate it to ensure it is still in good condition. It’s best to donate paint as soon as you discover you don’t need it, such as when you change your colour scheme, rather than holding onto it just in case. Don’t mix waterborne and solventborne paints. If mixed, paint cannot be re-blended or re-used. Properly sealed solvents and thinners have an almost unlimited shelf life. Keep and use. Solventborne paints require special disposal practices. They are also ignitable and present other hazards. These products must never be poured down storm drains, the household sink (especially if you have a septic tank) or on the ground. Solventborne paint should be disposed of as a household hazardous waste. Return to the Resene PaintWise service or hold for a ‘Household Hazardous Waste Collection Day’. If your local community does not undertake such programmes, contact your local Council for disposal guidance. Paint thinners, turpentine, mineral spirits and solvents should never be poured down a drain or the storm sewer. With the following simple steps, you can re-use these types of products. Let used turpentine or brush cleaners sit in a closed container until the paint particles settle out. Then pour off the clear liquid, which can be reused. Add an absorbent material, such as the PaintWise Disposal Kit material or kitty litter, to the remaining residue until it becomes dry. Finally, contact your local Council for guidance on disposal. These meet specific conditions endorsed by the Ministry for the Environment. Look for the Environmental Choice tick on Resene paint containers. Lower quality paint while cheaper in the short run is a false economy. It will break down quicker necessitating a repaint earlier. The biggest cost of any painting job is the labour – whether this is a painter you hire to do the job for you or your investment of time. It is better to spend a little more on the paint and get a longer life from it than to try to save a few dollars and take years off the paint finish. Similarly, if you buy a lower quality paint with an expected life of 4-5 years, this means over a 8 year period you will probably have to paint twice. In contrast if you bought a high quality paint with an expected life of 7-8 years you would only need to paint once during this period. The burden on the environment is considerably less with the higher quality paint. 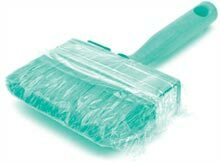 Wrap your brush in plastic wrap or place your roller in a plastic bag, squeeze out the air and tie the bag securely around the handle of the roller using a rubberband or tie top. This will keep the paint fresh while you are taking a break and will save you having to rinse out brushes and rollers repeatedly. Be PaintWise with Resene and we’ll all benefit from a healthier environment. Bring unwanted paint and paint containers into selected Resene ColorShop and let us take care of them for you. Resene will offer good quality paint to community groups for reuse and recycle packaging materials that are recyclable. Selected Resene ColorShops have been designated as Resene PaintWise collection centres. Drop off your unwanted paint and paint containers to these designated Resene ColorShops at any time during their opening hours. Full Resene ColorShop address and phone details are listed in the Resene PaintWise brochure or on the Resene website. You are welcome to bring back paint and paint packaging no matter what brand. Resene branded paint and paint containers are free to return. A small charge applies to non-Resene branded product to help offset the costs of the PaintWise programme. The Resene PaintWise programme is run by the non-profit Resene Foundation funded by contributions from Resene, a small levy on retail paint purchases and trade returns. Leave small amounts of waterborne paint in its container, put out of reach of children and leave the lid off for the paint to dry then bring it in. Due to safety requirements, paint and paint containers will only be accepted at the designated Resene ColorShops during normal store hours. Sorry, paint and paint packaging returns cannot be accepted by any other Resene ColorShops. See the Resene PaintWise acceptance list on the Resene website or in store to see what you can return to the Resene PaintWise service. Visit www.resene.co.nz/paintwise or ask your local Resene ColorShop staff. 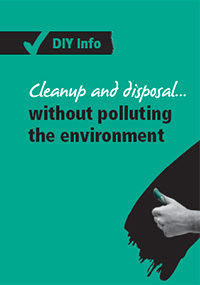 View Reduce, Reuse and Recycle information in brochure form. You will need Acrobat Reader.